So while I’m still processing this ridiculously wonderful season, I received an email asking if I’d like to give away a DVD to help baseball fans get through the long, cold, MLB-less nights we have ahead of us. In the uplifting spirit of the classic sports documentary Hoop Dreams, comes ROAD TO THE BIG LEAGUES, a grand-slam documentary from filmmaker Jared Goodman. Offering a fascinating behind-the-scenes look at the Dominican Republic’s obsession with baseball, viewers will quickly understand that, to the residents of this island nation, America’s National Pastime is more than just a game – it’s a way of life. And as the 2013 Fall Classic® gets underway, IndiePix® brings ROAD TO THE BIG LEAGUES to DVD. 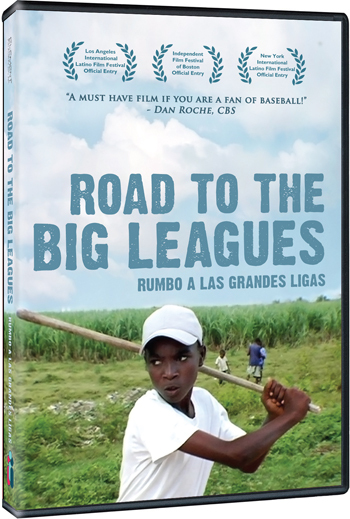 Featuring interviews with Dominican big league stars such as David Ortiz and Vladimir Guererro, this documentary, called “a well-addressed portrayal of pursuing a dream, believing in your heroes, and putting every obstacle aside,” also features championship-caliber extras including a behind-the-scenes featurette from the Dominican Winter League, David Ortiz in training, an interview with director Goodman and more! IndiePix Films is being terribly generous this November, offering up five copies of this DVD to the friends of Toeing the Rubber. Now I’d love to make this difficult with a trivia contest or the like but I think our brains are all still full of BEARD so I’ll make this easy (besides, I’m pretty sure we’ll be having another DVD giveaway coming up that folks will be excited for and I’ll need to make you all work a little for that one!). So if you’d like to receive a free copy of ROAD TO THE BIG LEAGUES just leave a comment either here on this entry on the blog or on the thread where this entry is posted on Facebook. I’ll give you the rest of the week…until midnight on Sunday…and I’ll pick five random people and be in touch with you once I pick the winners! So talk at me, peeps, and you could win a great little prize!